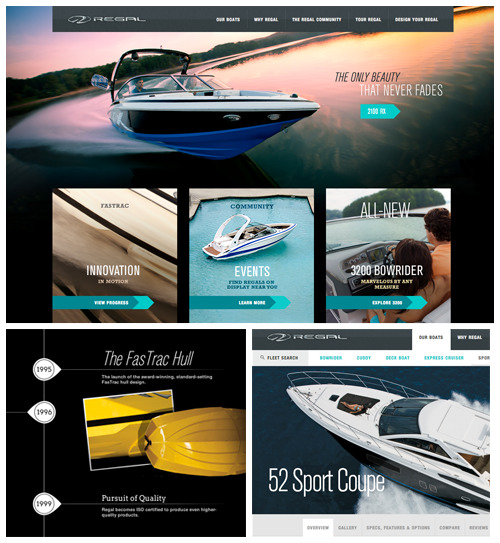 Regal Boats wanted a new website that would build an inspiring, life-long relationship between its boats and buyers. We couldn’t resist collaborating with a brand that shares our core values of forward thinking, innovation, high standards and a bold taste for adventure. 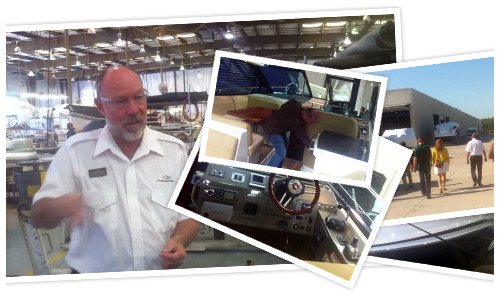 Regal Marine Industries has set world-class standards in the boat making industry for four decades. The company has been awarded for its dedication to craftsmanship, its employees and family. It’s obvious in the quality of their sport boats, cruisers and yachts. Before taking off, our challenge was getting in the boaters’ minds. Regal Boats spoke to a wide audience. We needed to reach both loyal customers and prospective ones, so we discovered a universal desire: People buy sport boats and cruisers for luxury and ultimate leisure. The strategy focused on empowering anyone interested in boating to experience the lifestyle and the product for themselves. With Regal Boats, Our course was to immerse audiences in the brand’s boats and stories to inspire them to live by their own compass. 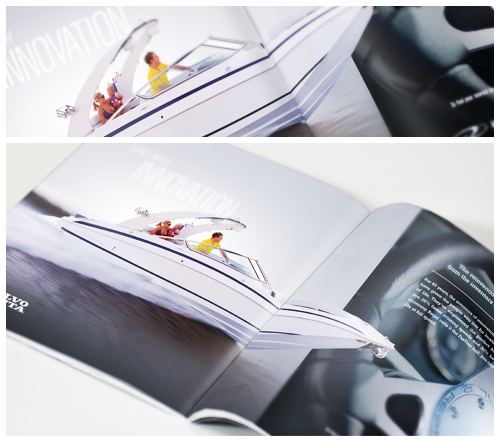 When it came to UX and UI, our challenge was to tie Regal Boats’ products with a diverse set of lifestyles. Regal’s surplus of product information required an intuitive flow to help guide users. 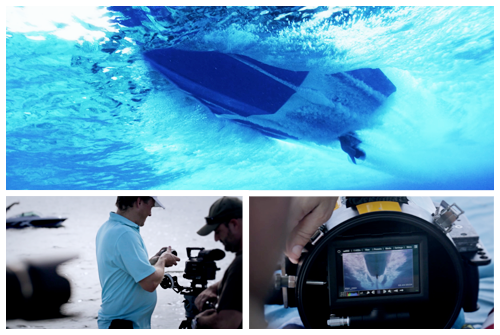 We planned content relevant to each boat and helped audiences find the model suited for them. We moved swiftly from mockups to wireframes and then a prototype, complete with a functional navigation to help our teams and the client see how the site would feel. We took an adaptive design approach to improve the usability of the experience for all screens. Our mission was to elevate the overall emotion of the site. A new look for Regal’s brand emerged through a digital style guide of new typeface selections, copy and primary and secondary brand colors. Photos were carefully chosen to elevate the brand’s position as an innovator whose product takes you almost anywhere. The website pulls you in with the first image you see. Full screen photos of boats-in-motion capture the essence of boating for the thrill of it. Our print ad also extends Regal’s new direction by carrying the visceral emotion and innovation. Choosing your boat takes you to individual models on the site, where you can see and fully customize all of the options. Swapping between colors, features and innovations takes seconds. A huge part of the boating experience is being a part of an exclusive community. To encourage buyers and prospects to join the lifestyle, we added social media feeds including Twitter and Instagram on the website for owners to share their Regal experience. 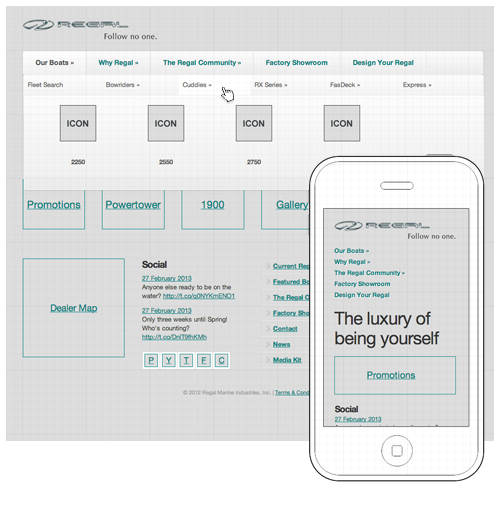 We updated designs and the technology of the website for the digital age. An adaptive site lets viewers experience a different feel on desktops and mobile phones. Our dynamic CMS also gave Regal an easily manageable system to update almost every component of the website including latest events and promotions. 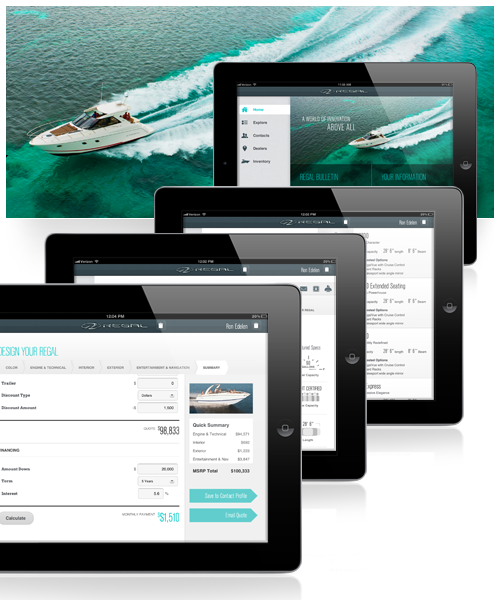 In addition to the consumer-facing web presence, we created a dealer iPad app to help unify the entire sales experience. Regal Boats’ core values of quality and innovation are captured in a brand new website that conveys the visceral feeling of being on the water. Through meaningful stories and relevant content, we take audiences through the experience of owning a lifestyle of luxury. The boat owner’s dream becomes yours to take. About our guest blogger: Ron Edelen is the creative director of Myjive. He has more than 10 years of experience in creating interactive stories for broadcast, mobile, web and installations. 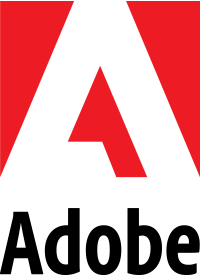 Edelen is a partner and a co-founder of Myjive, a digital agency, proven to create interactive and engaging digital marketing solutions. Myjive works with brands including Volvo Trucks North America, Regal Boats and the Hilton Corporation with a mission to help brands evolve in the digital age. For more information, visit www.myjive.com or follow us @myjive. From time to time AIGA Charlotte likes to feature a cool project by someone in the Charlotte community. Do you have a project you’d like to share? Contact Rhonda Sergeant.